The Protekt™ 500 Mattress with (VGPT)™ Visco Gel Polymer Technology is a revolutionary support surface that provides unprecedented pressure redistribution, rapid heat dissipation, and vast increases in breathability compared to traditional foam. (VGPT)™ Visco Gel Polymer Technology works by allowing air to pass through open cells, channeling it away from the body instead of trapping it within the closed cells of standard memory foam. The infusion of gel polymers throughout the foam contributes both cooling properties and the virtual elimination of static fatigue. As a result of the alliance between open cell foam and gel infusion, the Protekt™ 500 holds its shape better, redistributes pressure over a larger surface area, and successfully channels heat away from the body, keeping patients cool, dry and comfortable. Heel slope redistributes pressure from heel to the entire leg. Precision cut air pockets allows deeper submersion and increased air circulation. 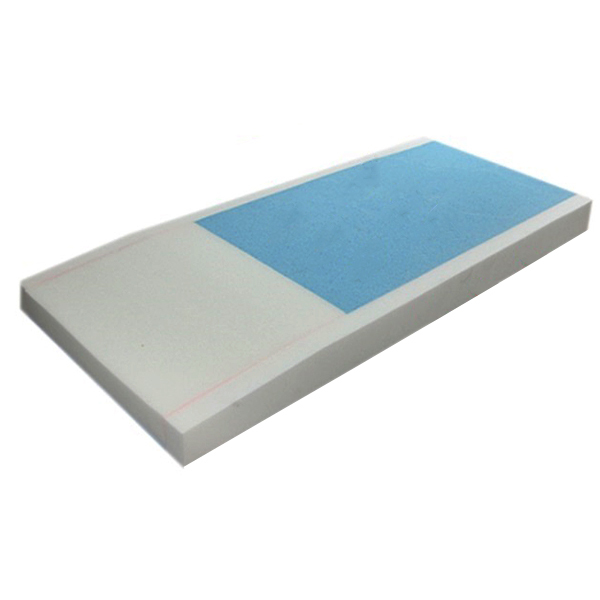 VGPT™ is open-cell Visco Memory foam infused with gel Polymers. Reduced occurrence of pressure sores by channeling heat away from the body significantly faster than traditional foam, virtually eliminating perspiration. Superior pressure redistribution is delivered by providing more support and less cradling at higher levels of compression, redistributing pressure over a large surface area eliminating static fatigue. Protects vulnerable heel area with the patented Lure-Quilt™ foam and a 30° slope redistributing pressure to the entire leg and away from the heel.